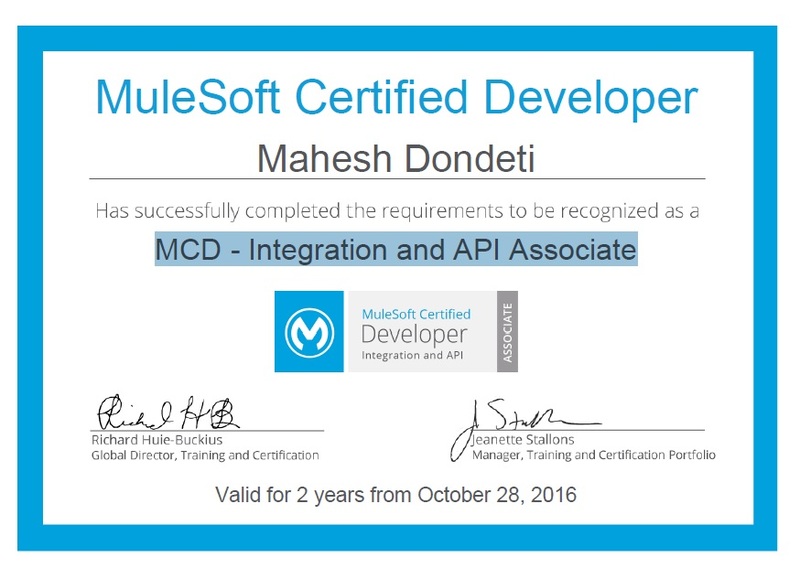 Are you interested in learning MuleSoft technologies and want to become a certified like me ,Here is an opportunity . 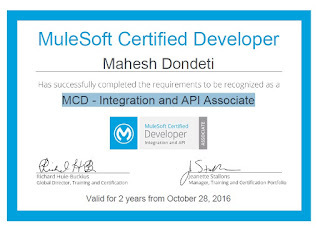 MuleSoft offering MuleSoft Certified Developer – Integration and API Associate exam for free which is cost of $120,Follow below steps and get certified. Mulesoft team sends you training videos and assignments every week , total 8 weeks program (Don't worry just you need to spend 3 hrs/week). Best part is ,we can write exam in our convenient time after voucher code received and need pass exam in 3 attempts. Special thank for "Syamala and Roja" for their help to clear the exam. Please post any issues/query’s related to IBM Bluemix,IBM BPM,WODM,MuleSoft and DATAPOWER to "maheshitsolutions@gmail.com”. Please share your valuable suggestions and feedback to my mail id"maheshitsolutions@gmail.com" to improve myself ,without fail. This information is really awesome thanks for sharing most valuable information.